This entry was posted in Competitive Analysis, Economics & Politics, Housekeeping, Investor Psychology and tagged AAPL, Competition Demystified, Elephant in the room, Prejudices, Ron Paul, Stossel, Strategic Logic, Value Vault. Bookmark the permalink. Greenwald is almost embarrassingly wrong on AAPL. However, I think he would say their success is unsustainable. They have been a step ahead of their competitors in terms of design, but in an industry with a swift pace of technological change, it can’t be sustained. “In the long run everything is a toaster. . . ” At this point though, they have been able to introduce product after product that captures the imagination of the public. Their lead has enabled to create EOS and and some consumer habit. I think Greenwald would say that their competitive advantage period has been unusually long but, with aggressive competitors nipping at their heels, it can’t be sustained. 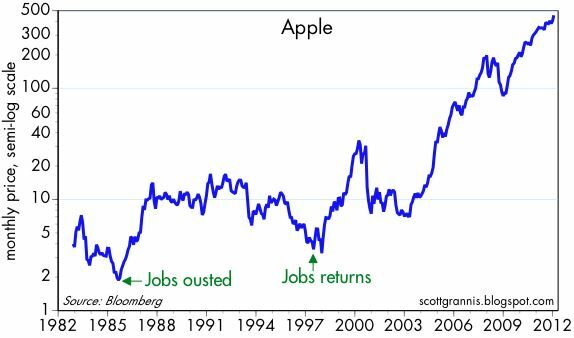 The market would seem to agree with him as AAPL gets a low EPS multiple. I’m sure Jobs was a “talented fanatic”, a term Munger used to describe Jack Welch, Sam Walton and the found of NCR (can’t remember his name and don’t feel like googling).